Towel snakes are the ultimate towel animal. 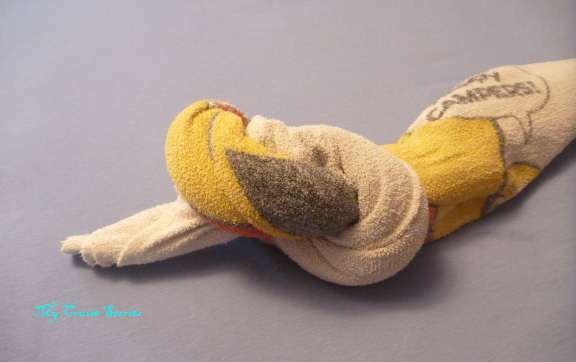 With just one towel, any towel or even a washcloth, you can make a snake. Anywhere, anytime in just minutes, a towel snake. I’m including two sets of snake folding directions in this blog. One set for a cobra comes from Carnival‘s towel creations book. The other, more versatile snake is my variation of that. Carnival’s snake takes a large towel and the snake can only be positioned one way. Mine can use any towel or washcloth, and be positioned any way desired. That’s why I like mine better. 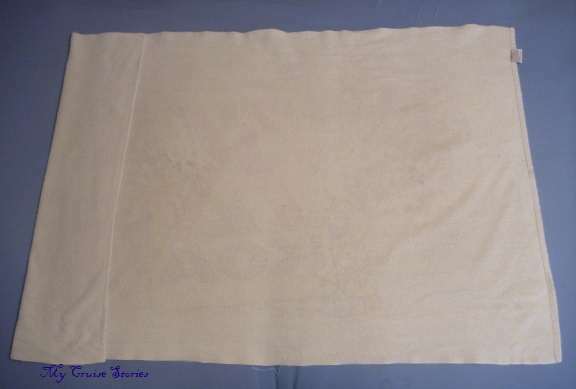 Lay a large bath towel out flat. You can use a beach towel (like I did in these pictures,) but it comes out better with the bath towel (like the pink striped snake in the top photo.) 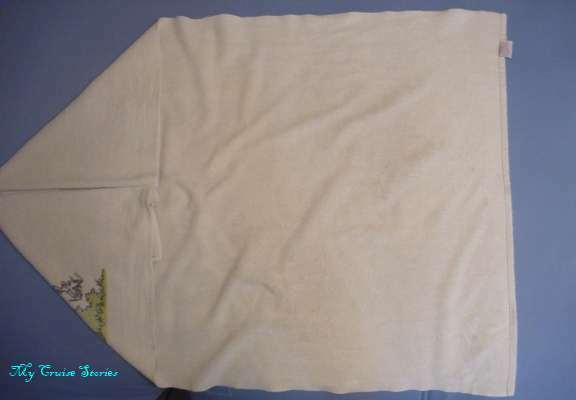 Fold over one short end of the towel. The book says 2 inches, but the amount isn’t all that critical. Fold over one corner on the end where you already folded the edge. 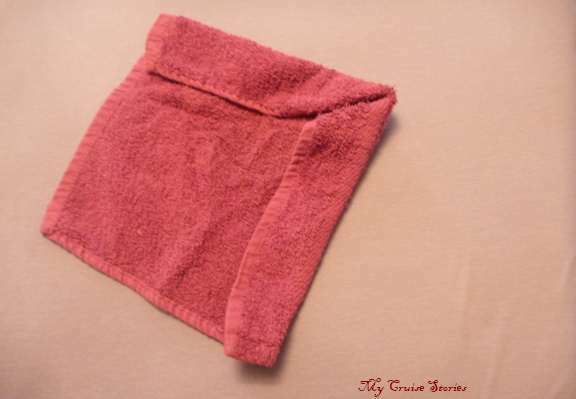 Fold it to the middle of the towel. After folding down corners and rolling long sides to the middle it now somewhat resembles an arrow or spear. Twist the towel so the whole thing is twisted together except the pointy end. This bit is not in the book, but if you pull the corner of the towel out of end of one roll it will look far more like the tip of a snake’s tail than 2 rolls ending abruptly does. Cover the end of the other roll with towel from the roll you pulled the tip from so it has just the one tip showing at the back end. Tie a knot in the rolled, twisted snake body. This is what holds it all together and also what limits it to one position. 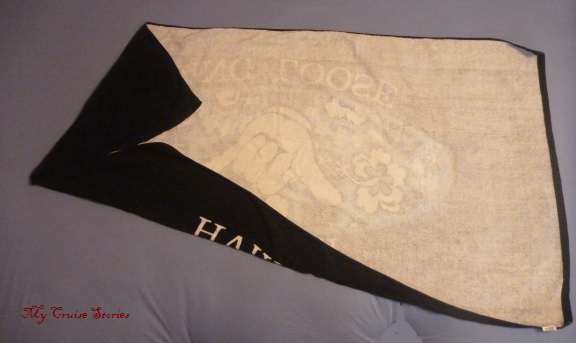 Pull towel out or tuck towel in as needed to shape the pointy end into a snake head. Add eyes or sunglasses so it looks more like a snake and less like a towel. A forked tongue works well for this too. Use paper or felt to make eyes and tongue. 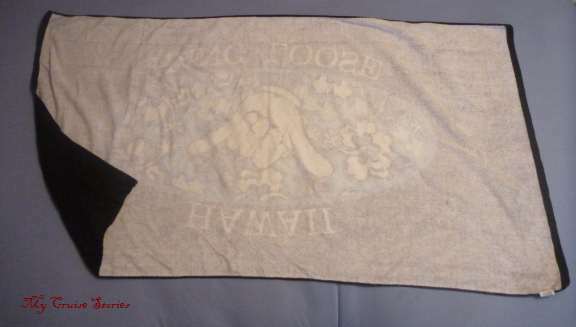 Lay towel (or washcloth) out flat. Fold down one corner. Fold a pointy end by folding over the both sides so they meet in the center of the corner you previously folded down. The folds won’t be even, they just need to meet at the middle of the pointy end these folds make. Start rolling on the side that has the most towel folded over. Roll all the way to the far end in just one roll. When you reach the middle, just keep on rolling until the whole towel is rolled into just one roll. This is what gives this snake the versatility to position any way you like as it does not require a knot to hold two rolls together since it does not have two rolls. 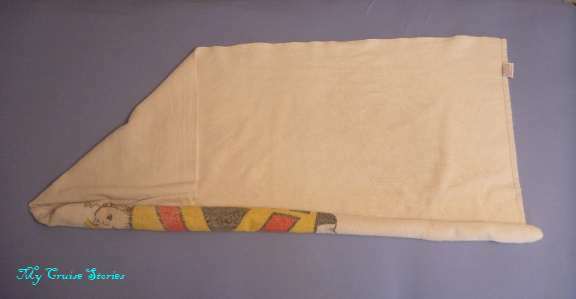 Pull towel out of the roll or push it in as needed to shape the snake head at the big end of the roll where all the folds were. Add eyes and a tongue. Snake can be stretched out long, coiled, draped over chairs, or positioned in any way that strikes your fancy. 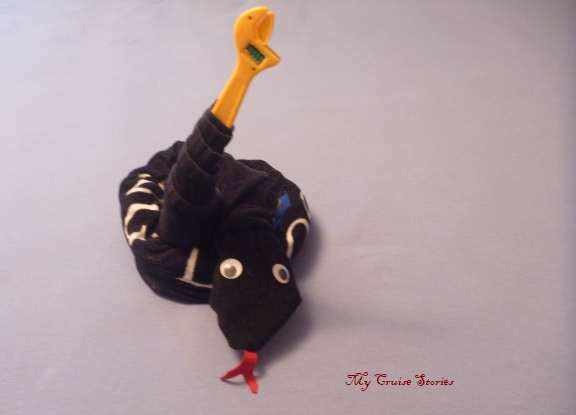 This snake is so versatile that someone looking for a creative baby shower gift could make one from a baby towel and insert a baby’s rattle into the tip of its tail, thus turning it into a rattlesnake. I had neither a baby towel nor a rattle, but this snake has a similar sized toy as a substitute. 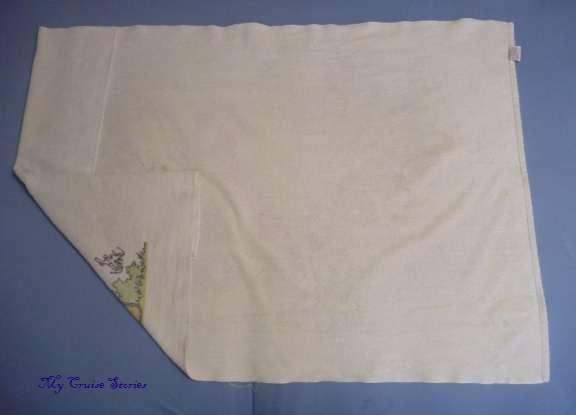 The same directions work for any size towel or washcloth. People use towel cakes as a means of giving bath towels as a gift at bridal showers. Why not towel snakes as a new creative way to give towels as gifts at baby showers or housewarming parties? Dish towels and dishrags could be substituted for bath towels and washcloths if someone wanted a creative way to give dish towel sets as gifts for a housewarming or bridal shower. You could even roll small gifts up inside the snakes and use them as wrapping. The possibilities are limited only by the boundaries of one’s imagination. 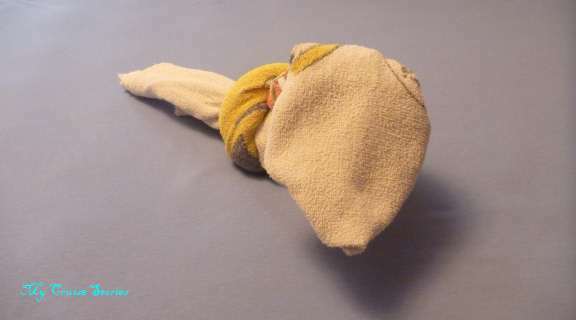 I also have lots of other blogs on how to fold a variety of different towel animals. 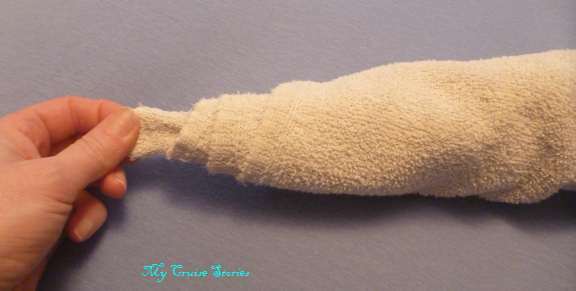 This entry was posted in Towel Animals and tagged baby shower gift, bridal shower gift, crafts, fun, housewarming gift, how to, photos, snake, towel animals, towel folding. Bookmark the permalink. The perfect towel animal for Lord Voldemort’s birthday. Somehow I can’t picture Voldemort having a birthday party. you’re right, yours is much better! What’s with the knot in the other one? that just looks silly! It needs the knot to hold it together because it has two separate rolls twisted together. Mine is all one roll so it doesn’t need anything to hold it in place.